3 double, 1 single (plus l large attic) bedrooms. 2 bathrooms. Sleep up to 14. BOMY, 45 minutes from Calais. Charming well-modernised family home in a quiet friendly village near Fruges market town. Sleeps up to 7 downstairs plus a further 7 upstairs if needed. Downstairs: 3 double bedrooms (1 king size bed). 1 single bedroom + cot. Upstairs: 1 large room (fun for children) with 7 single beds. 2 excellent bathrooms. Spacious dining room (open plan to well-equipped kitchen) and sitting room, both with oak beams, open fireplaces and doors to relaxing garden including sheltered terrace and orchard. Central heating, exterior WC, BBQ, garden furniture, games including table football, table tennis and children's slide. Regular and recent improvements made to property - such as all four downstairs bedrooms, and also the sitting room, dining room and kitchen, redecorated and renovated. All doors and windows of the house are recently fitted wooden framed double glazed units, with most being fitted new in late 2018. Brand new boiler, attic heaters and oven in late 2017. Beautiful sandy beaches, golf, riding, bird sanctuary, historic towns and sites including both world wars. Many good restaurants. Duvets and pillows included for all beds. Linen and towels are optional extras. Electricity for lighting is included. Central Heating and logs for fires, if used or needed, are extras. See weekly rental rates in the rates section. In order to cover fixed costs, the minimum rental charge for any period at any time of year is £300. Further details available on request by email. Linen is available for hire. Large capacity Bosch fridge freezer. Rosieres new electric oven . Ideal for large family get together or weekend escape with friends. It has a big dining/breakfast room with large farmhouse table, as well large lounge with real fireplace. 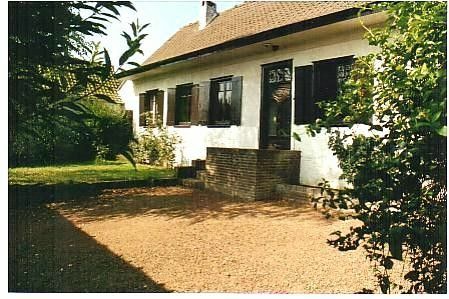 It comes with large garden and patio area, all set in a quiet rural part of France and only an hour from Calais. Great value. We spent the weekend at this property in the hopes of getting some much needed R&R and that's exactly what we got! It's easy to find and less than an hour away from Calais in the French countryside. Lovely quiet spot and a lovely rustic house with lots of space to relax. Obviously with the cold of winter, we stayed tucked inside the house in the warmth but the big garden looked great for summer fun and BBQs. We fell in love with this house from the moment we set foot in it and we would have no hesitation in recommending it to anyone and staying there ourselves again. The location is perfect for exploring the local area and is less than an hour from the coast and from a number of famous historical battle sites. The house itself oozes charm and old fashioned comfort and was so cozy and warm when we stayed during an extremely cold period of February that we never felt the need to light either of the two fireplaces in the kitchen and sitting room. The large garden with BBQ area and the very large sleeping area upstairs suggest that this would be a great rental for a family or large group come summer time. A brilliant house with everything you need for a comfortable and relaxing break. This rural spacious house although only an hour from the channel ports is really in the heart of France.With a large garden and surrounding countryside it is ideal for a quiet family holiday with the advantages of being close to the sea and many other attractions.The house is very comfortable, well appointed and ideal for large family groups, I would recommend this rental to anyone that enjoys the French countryside. Having stayed in many French holiday lets I can honestly say this is the best yet. We always go away for November the 5th. Our dog hates the never ending fireworks! This is a perfect place. A home from home. It is very very comfortable, well furnished and well equipped. The central heating was lovely and warm. Just the ticket in November. There is a lovely large private garden, very comfortable seating, well equipped kitchen and everything one needs and more. We thoroughly recommend this property. A big thankyou to the owners who have given a lot of thought to making their property "simply the best." Our party of 8 ranged in age from 20 - 75. The house was wonderful, full of typical rustic charm. Ideally situated in a very quiet village but within easy distance of the beaches, shops and surrounded by history. I would definatley consider a return visit and will recommend to my friends. 45 minutes from Calais in the historic Artois countryside. It is only 15 minutes drive from junction 4 of the Calais to Paris autoroute. Also, well under an hour from Boulogne. Very near the famous Agincourt battlefield. Near many World War 1 & 2 historical sites. NB. which have separate club houses about 1 km apart. Note - quoted green fees may have increased!